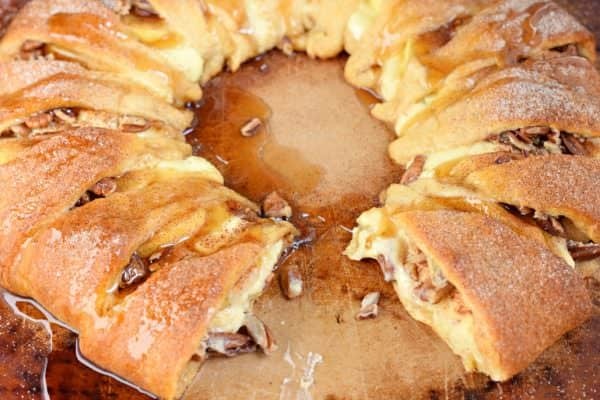 This Apple Cheesecake Ring is the perfect holiday breakfast, or serve it to your family for brunch! 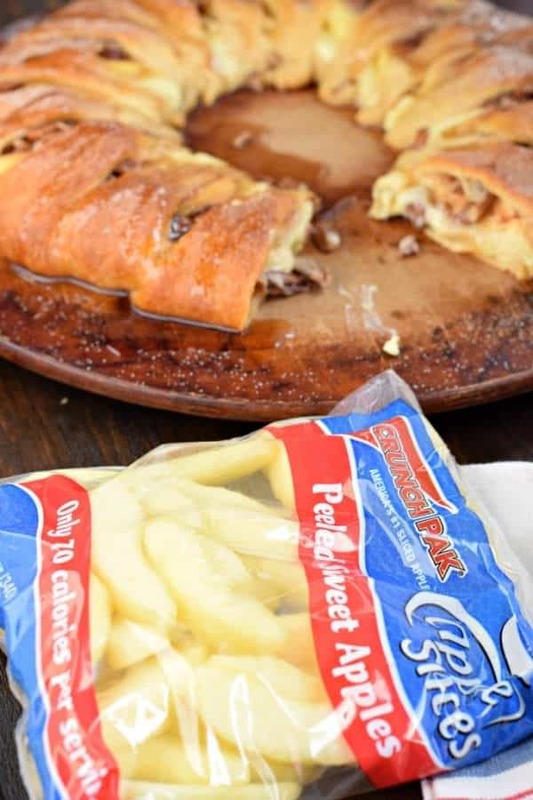 You’ll love the flaky crescent roll crust, the sweet cheesecake filling and the crunch of apples! Thanksgiving is a day devoted to food. From the turkey to the stuffing…to the desserts, right? But what about breakfast? Do you starve yourself all day? Because the years I have done that, I don’t enjoy the meal as much. I need to re-train those stretch marks on my belly to make room for the meal, haha! 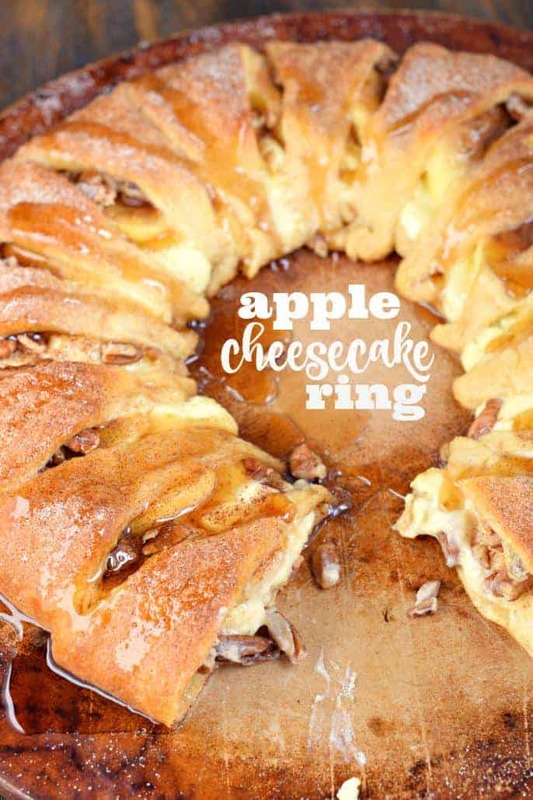 What better way to do that than with this delicious Apple Cheesecake Ring! I even made a little video (above) to show you just how easy this is to assemble! I’ve been an ambassador for Crunch Pak apples for many years. Not only do I LOVE the convenience of their sliced apples…but I love that they offer a variety of products. Including these peeled, sliced apples. Which are perfect for baking! They not only taste delicious, but make assembling this apple ring a breeze! I debated finishing this apple ring off with a glaze (you know I have difficulty not adding frosting to baked goods)…but opted for some pure Maple Syrup instead. It was the perfect finishing touch, if I do say so myself! So tell me, what’s on YOUR breakfast table Thanksgiving morning? 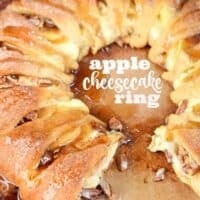 This Apple Cheesecake Ring is the perfect holiday breakfast, or serve it to your family for brunch! 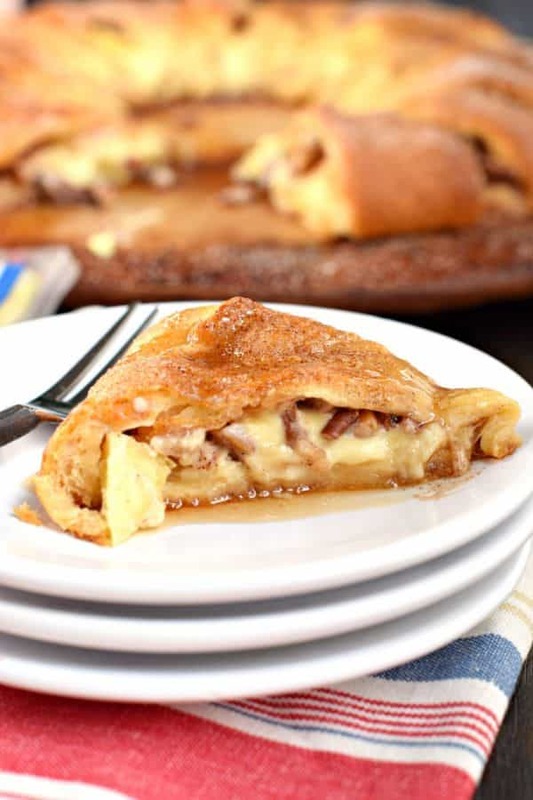 You'll love the flaky crescent roll crust, the sweet cheesecake filling and the crunch of apples! Preheat oven to 350°F. In a small bowl, beat the cream cheese, powdered sugar, and egg together until well blended. Set aside. Unroll crescent rolls, and separate triangles. Lay the first package in a large circle, connecting the wide part of the crescent roll in the center. Top with second package of crescents. Use fingertips to combine and create an indentation (see video for demonstration). Dollop the cream cheese mixture in the indentation all the way around the ring. Top with sliced apples. Sprinkle half of the cinnamon sugar over the apples, and top with pecans. Roll the triangle edges up over the filling, tucking the ends into the center of the ring. Sprinkle with remaining half of cinnamon sugar blend. Bake for 25 minutes until crescent roll is browned. Remove from oven and cool 5 minutes. Drizzle with maple syrup and serve warm! ENJOY! 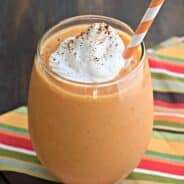 Love this for Thanksgiving breakfast! Though I’d probably eat way too much and end up spoiling my dinner 🙂 I’d totally be OK with that! Oh my gosh, this looks amazing! 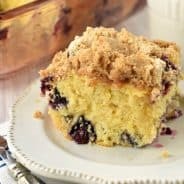 Breakfast or afternoon treat, I would happily enjoy a piece any time! This cheesecake ring sounds like the perfect addition to a fall brunch! Hahaha! I have tried starving myself in preparation of the big meal, and you are right. It doesn’t work! Love that we are on the same brain length with the apple and crescent roll goodness! 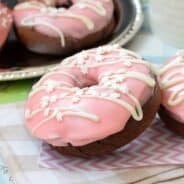 I cannot believe you didn’t glaze it…I know you and your frosting/glaze!!! LOL! But maple syrup sounds pretty fabulous too!!!! What kind of a pan do you put the crescent rolls on to bake it? I love this it is quick for the holidays when you are waiting for company. And your house will smell warm and cozy.